On February 21, 2019, the handover ceremony of China-aided anti-malarial drugs was held in Juba. H.E. He Xiangdong, Chinese Ambassador to South Sudan, Hon. Riak Gai Kok, Minister of Health of South Sudan, Hon.Salvatore Garang Mabiordit, Minister of Finance and Planning of South Sudan, Hon.Deng Dau Deng, Deputy Minister of Foreign Affairs and International Cooperation of South Sudan, Mr. Cai Senming, Economic and Commercial Counsellor of the Chinese Embassy in South Sudan, were present at the ceremony. On behalf of President Salva Kiir Mayardit and the South Sudanese Government, South Sudanese Representatives lauded Chinese Government for its long term support to all sectors of South Sudan. They said that China always firmly stand with South Sudanese people during South Sudan’s difficult times. 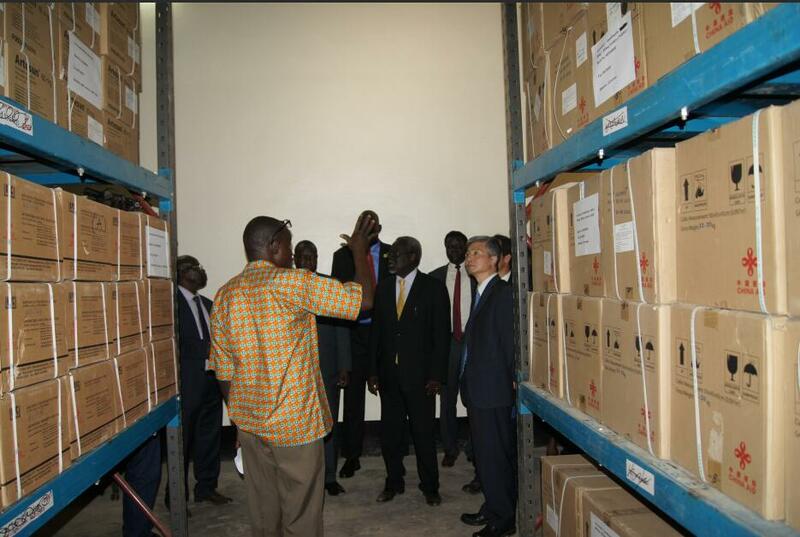 This batch of anti-malarial drugs will surely play an very important role in combating malarial in South Sudan. They hope China could continue to help South Sudan achieve economic development and improve South Sudanese people’s livelihood. Ambassador He said that Chinese Government and people share the feeling of South Sudanese people who are suffering a lot from malaria. He hopes that this batch of anti-malarial drugs worth over 5 Mllion RMB could delivered to all the counties and states of the country at an early date and help the people to effectively fight against malaria. “China attaches great importance to the friendly cooperation in the field of health between our two countries. China will continue to help South Sudan in developing health sector within its capacity.” said He.